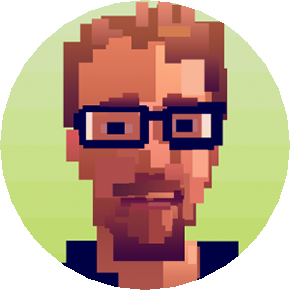 ColePowered Games Ltd. – The Game development adventures of Cole Jefferies. I spend too much time making games and not enough playing them, so I’ve decided to start writing a semi-regular piece on games that I’ve recently played. Hopefully they will force me to think about them and encourage me to play more! See previous ones here. The year is 1999, dawn is breaking on the age of the internet meme. I’m an internet enforcer: A a virtual sheriff sent to patrol the wild west of the world wide web. I’ve just shut down a primary school teacher’s website for using copyrighted images from a 1960s fish detective cartoon. That’ll teach her. Meanwhile April, my virtual angel hamster, shits on my desktop. This is Hypnospace Outlaw, and it’s glorious. We’ve lost something, haven’t we? 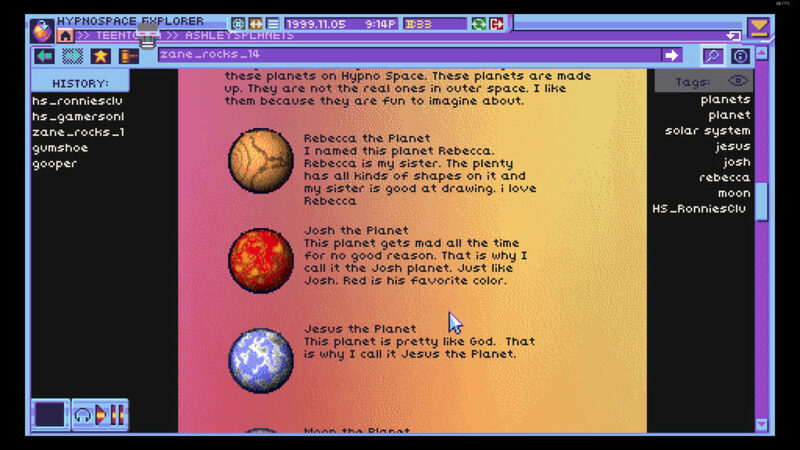 Hypnospace harks back to a time where the internet was largely about self-expression: Without the slick but soul-less social media sites of today, web pages were often complete a mess but highly individual- a labor of love. 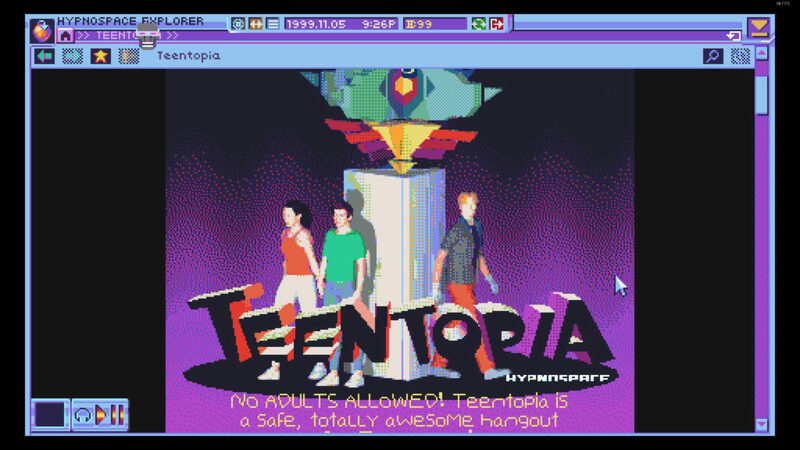 The creative spirit that accompanied these times really appeals to me, and there’s an underlying sweetness to the writing and humor in hypnospace that magnifies those rose-tinted glasses. Jay Tholen and Xalavier Nelson Jr. have created something special that resonates with anyone online in the 90s. It is, of course, better than the real thing ever was- even the OS colours are vibrant blues and purples instead of grey like the Windows of yesteryear. I don’t think anyone at the time really thought the early internet would hold a place as a cultural touchstone, but it totally does. The soundtrack is a particular highlight and one that I really cannot talk about anywhere near as much as I would like for fear of spoiling surprises. The game is quite musically focused; every page has an accompanying song ranging from midi sequences to advertising jingles to nu-metal songs. Occasionally it presents me with such a cacophony of low fidelity midi sound that I’ll have to press the mute button. Authenticity! But songs by fictional washed-up 80s rock star ‘The Chowder Man’ represent this game at its absolute best. Hypnospace is actually similar to Shadows of Doubt in what I’m trying to achieve with the core mechanics: It’s a detective game with an open world of sorts. That world is its killer feature, in that it’s fun to explore regardless of anything else, and you are incentivized to do so through the acquisition and spending of the game’s currency. It has detective style cases that unfold as the main story, but the player is otherwise given freedom. Shadows, of course, will be very different in how you explore the world, but it’s encouraging that this approach works well. Reach the end of certain cases and you’ll jump forward in time; now everything has changed. Pages have been updated, current events unfolded and new zones unlocked. It gives the game a whole other dimension, and I think without this progression the world could start to feel stale. I don’t have many criticisms; it achieves what it sets out to do pretty damn well. I tend to play for 45 mins or less rather than hours- there’s only so much fluorescent assault my eyeballs can take after all. After a couple of cases the main objectives take on more of a puzzle-like form, and if you don’t ‘get it’ then it can leave you scouring pages rather aimlessly. The detective aspect reminds me of Her Story, but less focused- with a whole fake internet at your fingertips it’s easier to go down the wrong rabbit hole looking for something. Luckily there is a nice hint feature you can access by searching ‘hint’. It’s a great way to handle things as this game doesn’t feel like it should be trying too hard to hold back content/progression. April died though. I feel awful about that. Shadows of Doubt is a detective stealth game set in a fully-simulated sci-fi metropolis! There’s been a murder and it’s up to you to solve it by any means necessary, with the condition that you keep a low profile. A unique mix of procedural generation and hand-crafted design enables every room of every building to be explored. Citizens go about their lives independent of the player as you watch from the Shadows, in search of crucial information. Read previous dev blog entries here. As you may have seen in previous entries, I want the game to have a mix of interiors ranging from old and murky 1930s decors to more modern 70s and 80s styles (the game itself is set in the 80s- albeit an alternate reality). The first task was creating a custom shader that could take walls, floors, even props and apply different colours to them. Manually creating unity materials for each of these, then a range of colours wouldn’t really be feasible due to the sheer range of them I would need. Creating a custom shader with a map that told where to apply certain colours seemed to be the way to go. I’m a novice when it comes to writing shaders, but thankfully Unity’s new shader graph came to the rescue here, and it didn’t take me too long to come up with something that functioned as intended. Remember that green striped wallpaper that was applied to every single interior wall before? Well, now I can have that in any colour combination I want. Progress! Now I’ve got a base material that I can alter using a couple of simple inputs. But how do I get my game to look like the style I want? I would have to come up with a system that selected colours similar to the designs I mentioned a couple of months back. I decided to make a custom palette that features 5 colours: 2x Primary and secondary colours that compliment each other, along with a neutral colour. I used scriptable objects, so I could easily create palettes in-editor. After some messing around I found a great way to pick these 5 colours. Using images found on various sites and design books from the eras I want to mimic in game, I use coolors.co to pick a complimentary palette from them. It’s a great free tool that allows me to cycle through several palettes from each image to get one that I like. I can’t export into my scriptable object directly, but copy and pasting the colour hex codes doesn’t take long! 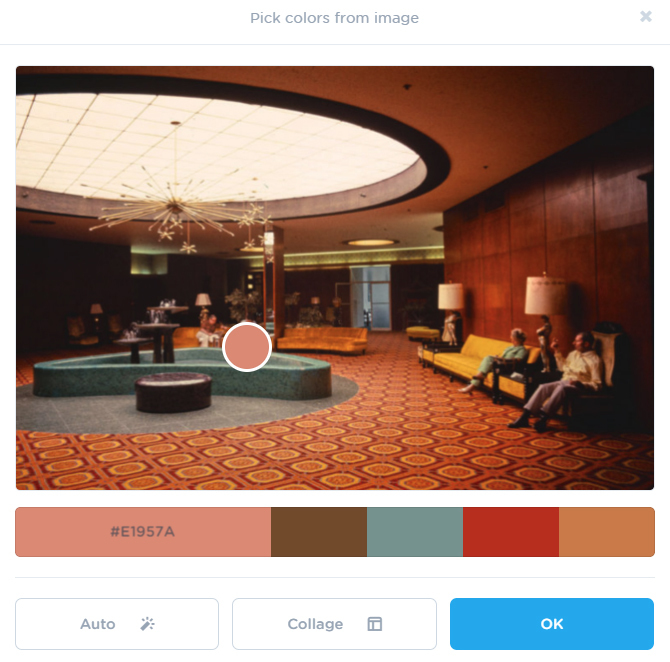 Modernity: How ‘modern’ this colour palette is in terms of design. Muted colours like the original green striped wallpaper may be suited to a less modern style, while brighter reds and oranges might be more suited to more modern styles. Richer citizens tend to be able to afford more modern decor styles. Cleanness: This one is more to do with the room type that citizen personality. ‘Clean’ palettes will be found more often in bathrooms or corporate environments. Loudness: I couldn’t think of a better name for this, but in broad strokes, this is how bold the colour scheme is. Bright reds, for example, are ‘loud‘, and are more likely to be found in apartments of more extroverted citizens. Emotive: In general how ‘warm’ or ‘cold’ the colours are. This is similar to the cleanness value but links to personality instead; more emotive citizens are more likely to feature these palettes. Now when a citizen is assigned an apartment, I can use a system that matches colour palettes to their personality! It’s already starting to make my previously labyrinth-like environments look like something more habitable. The next step is to start work on some basic props: Chairs, tables, beds etc.